The Foreign Ministers of the Czech Republic, Hungary, Poland and Slovakia were shocked by the news that clashes between protesters and riot police resulted in casualties in Kyiv. We strongly condemn the killing of demonstrators which cannot be justified by any reason. 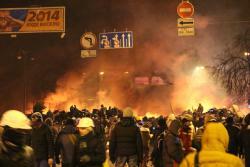 Ukraine has been witnessing a permanent and deepening internal political crisis for the past two months. According to the amendment to the Act on Reporting Citizens Residencies approved by Slovak Parliament on May 16, all Slovak citizens and foreign citizens resident in Slovakia will be obliged to declare to the state authorities prior to their departure any absence longer than 90 days. Anyone who fails to notify the authorities will be guilty of an offense and may face a penalty. The amendment will enter into force on July 1, 2013. The property prices have a significant effect on household spending and indebtedness, the mortgage market, investment development and ultimately also on overall economic activity, overall price changes and global financial and monetary stability in the medium and long term. The Ministry of Foreign and European Affairs of the Slovak Republic is preparing the change to the mechanism of statement formulation to EU legislation. This reform aims at evaluating the existing procedures and amending the cooperation among ministries and Parliament. The current mechanism has been in force for nine years and was updated for the last time in 2007. While Slovakia has a standard legal framework to support integrity, implementation is lacking. The Police Force, Judiciary, President, and Public Procurement Office have scored the lowest and are thus considered to be the weakest institutions in Slovakia. People in Slovakia see unemployment as the most crucial problem currently worrying the country. According to the results of a survey recently conducted by Slovak Public Affairs Institute (IVO), almost two-thirds of respondents (64%) consider the high jobless rate to be the most troublesome issue. The economic freedom in Slovakia worsened last year, the 2011 Index of Economic Freedom released by the Heritage Foundation says. Slovakia dropped two spots from last year while its overall score has decreased by 0.2 point, mainly as a result of declines in freedom from corruption and property rights. A year ago the country gained 0.3 points. During the live security tests, Slovak authorities planted eight plastic explosives, in the luggage of unsuspecting passengers. Seven items were detected by airport security, but the eighth one was lost and unwittingly transported to Dublin. The Slovak Republic changes the system of charging the road infrastructure from highway stickers to the electronic toll collection system. The new electronic tolling system put into operation at midnight on 1st January 2010.